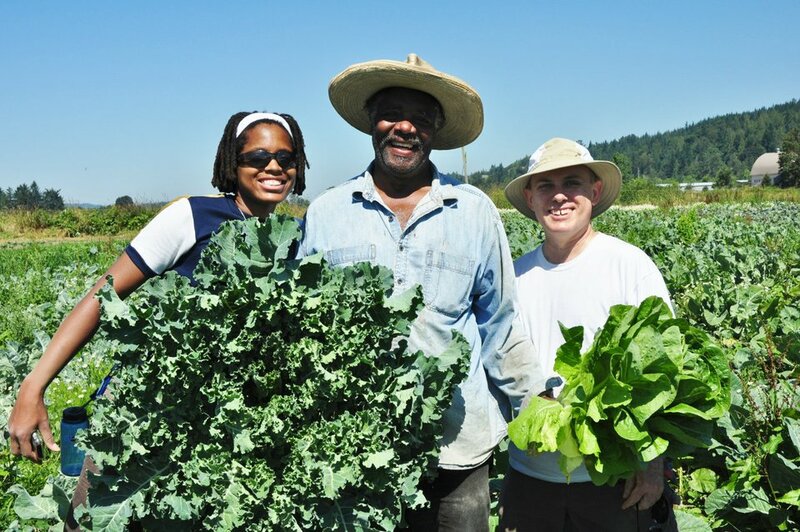 Food Justice Project: Organizing for Food Justice & Food Sovereignty in Seattle & everywhere! Teach-Outs with Central Co-op, Cascadian Edible Landscapes, Seattle Youth Garden Works with Spring into Bed!, Clean Greens Farm (in photo: CAGJ activist Victoria Gibson on the Farm with Clean Greens Farmer Tom Willis, and Teach-Out participant Chris Dunkle) HUG-Hilltop Urban Gardens for Food Day! AGRA Watch: Organizing to confront the Gates Foundation and Support Food Sovereignty in Africa! April 2: Fatou Batta event: Burkino Faso leader of Groundswell International and We Are the Solution Campaign, a women led campaign to resist the “green revolution”. Speakers included Sara Mersha, Grassroots International and Marcia IshIi-Eiteman, PANNA. Nov 5-15: AGRA Watch nominated Food Sovereignty Prize Winner, Kenyan Farmer Samuel Nderitu, Grow Biointensive Agricultural Centre of Kenya, who we accompanied and then hosted when he received the prize in Oakland (photo above left, Samuel); Farmer Exchange and visit to Marra Farm and public speaking engagements. NW Farm Bill Action Group: Organizing to transform the Farm Bill! From Sept 21 through Oct 1 seven CAGJ members participated in a joint CAGJ/Witness for Peace Food Sovereignty Delegation to Oaxaca, Mexico. On Nov 17 several delegates gave a report-back, along with one of the Mexican farming leaders they had met in Oaxaca, Eleazar Garcia. In 2011 CAGJ gave presentations to 15 community partners, educating and activating close to 1000 people. Highlights included our first joint presentation with the Gates Foundation at the Hillel Hunger Banquet, multiple presentations to Gregg Shiosaki’s culinary students at Seattle Central Culinary Academcy, and an AGRA Watch presentation at the Green Festival with Organic Consumers Alliance. CAGJ also tabled at one major event every month in 2011 from the Green Festival to Farmer’s Markets to Town Hall and Seattle Tilth, and we reached over 1,500 people! CAGJ organized fun, creative and effective actions throughout the year! June 11: Took photo at SLEE dinner reading “We Support Paid Sick Days for Food Workers” and helped to pass the Paid Sick Leave Ordinance! Created our own Media, and Making News! Created Independent Analysis – Articles by CAGJ Co-Chair Reid Mukai: Roots of Recent Uprisings, Raw Milk Gets Raw Deal From Feds, GMOs Coming to Parks and Lawns Near You, Lessons From Oaxaca to Occupy Movement: A Delegate Reports Back, Notes on a Global Occupation – read them on our website! Continued to create the debate about the Gates Foundation’s role in Africa through numerous articles and talks in national and international media, and at African Studies Conferences. Humanosphere Blogger Tom Paulson covered CAGJ’s presentation alongside the Gates Foundation in “Hunger Banquet and the Gates Fdn vs. food activists”, and our action at the Gates Foundation Headquarter’s opening, “Post-party news at the new Gates Foundation campus — Bono drops by to say hi and activists drop in to protest”. Yes! Magazine Online covered the story of African leader Fatou Batta and our other allies in “Women Farmers Feed the World”. GreenAcres Radio also covered this story in “We Are the Solution: Women’s Farm Organizations Thrive in Africa”. In 2011 CAGJ participated in 8 coalitions/alliances including the Puget Sound Regional Food Policy Council, WA Fair Trade Coalition, WA Farmworker Coalition, Making Change at Walmart Coalition, National Family Farm Coalition, Community Food Security Coalition, US Food Sovereignty Alliance and Occupy Seattle. In addition, the AGRA Watch campaign built relationships with African groups throughout the continent. This work takes time and energy but the pay off is creating a wide base of support so that when we talk, politicians listen! CAGJ participated in and presented at 8 conferences in 2011, including Organicology, Emerging Leaders, two Community Food Security Conferences, and US Food Sovereignty Alliance, sharing and learning from activists all over the world. One highlight was in November where CAGJ gave 3 presentations at the African Scholars Conference challenging the Gates Foundation’s investments in industrial agricultural practices in Africa. We made great strides in 2011 building a strong, resilient organization with capacity to effect transformative change. We focused on Anti-Oppression thru focus groups, community meetings and workshops, began transition to an online database, engaged in Communications training, and raised enough funds to pay our Director full-time through fun events like our Food Justice Trivia Night, Café Justicia Dinner, Fair Trade for the Holidays and our 5th annual SLEE dinner, with keynote by Detroit food justice leader Aba Ifeoma. We won several grants for the Food Justice Project Community Education trainings, Our Food, Our Right publication and the NW Farm Bill Action Network. Posted in Agra Watch Blog Posts, Food Justice Blog Posts, News, Projects, Trade Justice Blog Posts. Thanks so much for the good.I appreciate your efforts and keep it up in 2012. Merry chrismas and a happy 2012.